This is one of the most popular types of street tacos in Mexico City. Somewhat similar to Lebanese shawarma where the meat rotates on skewer beside the fire, it is made from corn tortillas, topped with meat, finely chopped cilantro, onions, and then, top it off with your choice of spicy sauce! 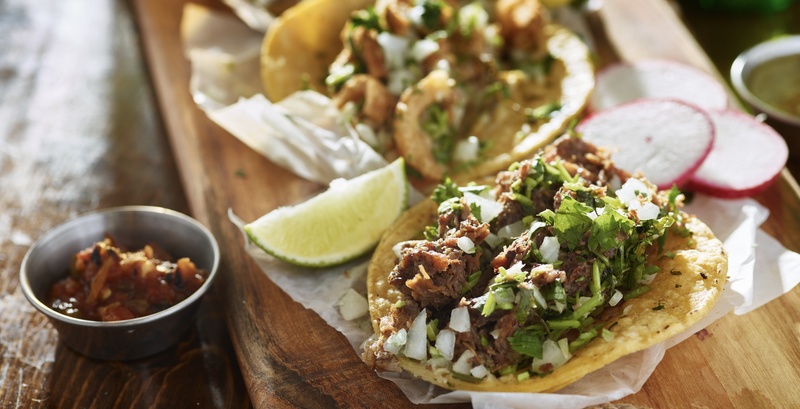 This type of street taco comes with fried pork or beef. It is served in tortillas with toppings of chopped onions, cilantro, lime and your choice of sauce. The meat will be fried in front of you in a giant round pan! There are two types of flautas: beef and chicken. Flautas are rolled tortillas with shredded beef or chicken inside. It will be deep fried. Once the tortilla is crispy, it is served with chopped cabbage, cilantro, tomato, shredded white cheese, cream and your choice of sauce. In Mexico City, blue corn is traditionally used for tortillas. This is why most of the quesadillas are bluish-black when fried. The blue tortilla has toppings of meat, mushrooms, diced potatoes and choice of spicy toppings and sauce. This is usually accompanied by a quesadilla because they both use blue corn for their tortillas. This is a simple snack of fried or grilled blue tortilla, with toppings of fried meats, boiled cactus leaf, cilantro, cheeses and red sauce. There are 3 types of churros in the city: plain, sugar, or chocolate coated. Vendors usually have several flavors of syrup to put inside the churros, too. They will make a hole and you can choose which flavor you’d like inside. The most popular is condensed milk. These street vendors can be found in parks and most metro stations. This is like a burger made from corn dough, fried like a burger! The main ingredient of Gorditas de Chicharron is pressed fried pork rind. It’s called gorditas (“fat” in English) because it is a huge fried corn dough. Inside you’ll find finely chopped onions, cilantro, lettuce, shredded white cheese and red sauce. Street foods in Mexico City are safe to eat and fun to watch because they are prepare in front of you. Prices vary from 10 to 40 Mexican Pesos. Mexico City is a perfect place for a frugal foodie! Good luck on your food adventure in Mexico!